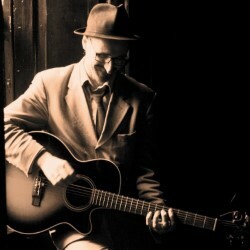 Ice-cool classics and red-hot originals from Scotland's native guitar-slinging troubadour. Echoes of Django Reinhardt and Richard Thompson as the inimitable singer/guitarist reinvents 20th-century masterworks and introduces some 21st-century future hits of his own, breathing new life into familiar material from the likes of Billie Holiday and Cole Porter via Tom Waits to Joey Ramone and beyond in a mellow and intimate early-evening show. 'Superb ****' (Skinny). 'Electrifying ****' (ThreeWeeks). 'Captivating ****' (TheWeeReview.com).